New Silver HEPA filter can help you avoid the flu by reducing airborne viruses by up to 50% all the while eliminating 99% of allergens AND 98% of bacteria! A high performance HEPA filter coated with silver, an eco friendly and non-toxic substance naturally provides anti-bacterial, anti-fungal and anti-viral protection. The Silver HEPA filter has been tested to reduce up to 50% of airborne viruses that cause the flu in an independent test lab and 98% of bacteria. This filter fits the T100 and the T300 air purifier. 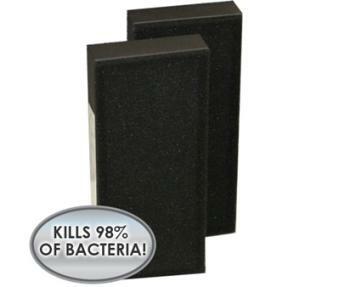 HEPA filter proven to eliminate up to 99% of dust, dust mites, pollen, pet dander, large particles and molds. Silver coating is natures antibiotic. Tested to eliminate up to 98% of airborne bacteria and up to 50% of viruses that cause the flu.